Charles Young has a fancy for building things. He decided to build a small building each day for a full year. 365 buildings in as many days. Each building is a miniature work of art and function. The windmill, pictured, runs around and powers an ax that cuts wood next to the building. Each morning Charles starts out building something. It takes anywhere from 30 minutes to 3 hours. As an architect of life-sized buildings, it is rare to have many structures actually built. So this is very satisfying for Charles, who studied architecture. Read more about him and his work at Make Zine. 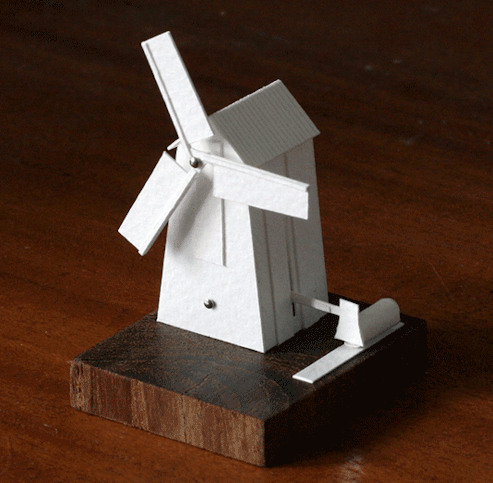 Charles Young and his work can be seen at his website, Paperholm.